One day not too long ago the employees of a large company in St. Louis, Missouri returned from their lunch break and were greeted with a sign on the front door. The sign said: "Yesterday the person who has been hindering your growth in this company passed away. We invite you to join the funeral in the room that has been prepared in the gym." At first everyone was sad to hear that one of their colleagues had died, but after a while they started getting curious about who this person might be. The excitement grew as the employees arrived at the gym to pay their last respects. Everyone wondered: "Who is this person who was hindering my progress? Well, at least he's no longer here!" One by one the employees got closer to the coffin and when they looked inside it they suddenly became speechless. They stood over the coffin, shocked and in silence, as if someone had touched the deepest part of their soul. There was a mirror inside the coffin: everyone who looked inside it could see himself. There was also a sign next to the mirror that said: "There is only one person who is capable to set limits to your growth: it is YOU. Your life does not change when your boss changes, when your friends change, when your parents change, when your partner changes, when your company changes. Your life changes when YOU change, when you go beyond your limiting beliefs, when you realize that you are the only one responsible for your life. "The most important relationship you can have, is the one you have with yourself." 2. Name the last five World Cup champions. 3. Name fifteen famous historical figures. 5. Name five Academy Award winners for Best Actor and Actress from the 1950's. COX'S BAZAR, Bangladesh - In March 2001 the Taliban destroyed two ancient statues of the Buddha called Bamiyan in an attempt to cleanse the country of Afghanistan of what they perceived as Hindu heresy. 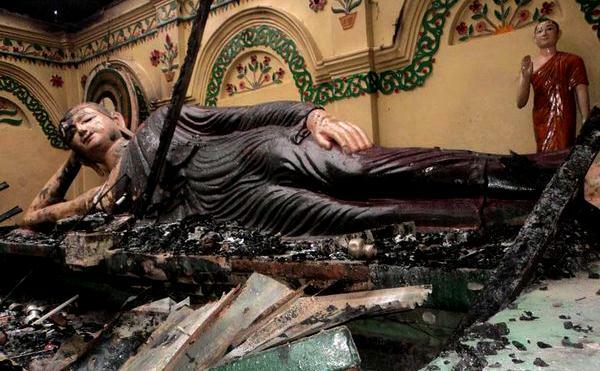 Today, nearly 12 years later, Buddhist temples and homes are once again under attack ostensibly to revenge an insult of Islam. At least 10 Buddhist temples and 40 homes of Buddhists were destroyed by an angry mob of approximately a hundred Muslims. The Cox's Bazar area is in the southeast of Bangladesh, and has historically been a model of successful, peaceful coexistence between Muslims and Buddhists. This coexistence has been assiduously maintained despite efforts to foment dissension by agitators. Similar to the recent violence that swept across the Middle East, Africa, and Asia in response to a video which depicted the Prophet Mohammed in blasphemous terms; the riots in Cox’s Bazar were instigated by Muslim protesters because they were outraged by a photo of a burned Qur’an which was posted on Facebook. The photo was posted on the Facebook page of a young Buddhist boy who claimed that he wasn’t responsible for the inflammatory picture. The ability of others to post photos on user pages is fairly simple. Adept users can easily circumvent privacy settings by tagging a photo with a person's name which then automatically posts the image to the unsuspecting user's page. The boy and his mother are currently under police protection, and in response to the violence the police have increased security presence in the area to prevent further protests from erupting. "We brought the situation under control before dawn and imposed restrictions on public gatherings," said Salim Mohammad Jahangir, district police superintendent for Cox's Bazar. Bangladesh’s is a Muslim dominated city of 150 million people of which Buddhists comprise less than 1 percent. According to witnesses, this small population refused to be intimidated by recent events, and over 100 Buddhists staged a silent protest of the attacks in the capital Dhaka on Sunday afternoon. MOUNTAIN VIEW, California - Google continues to be on the bleeding edge of technology which is reflected in the public’s increased demand for its innovative solutions, and its stock which is currently trading at $754.80 per share. Google, like Star Trek which presented revolutionary technology in television and film, i.e. the Tricorder which approximates cell phones developed decades later, is shaping the future. Now, Google has developed a self-driving Toyota Prius that is reminiscent of the cartoon series ‘The Jetsons,’ minus levitation. However, levitation may not be far behind as Google continues to push the envelope by developing technology that will reduce human error. On Tuesday, 25 September 2012, Gov. Jerry Brown test drove or rather rode to Google headquarters in a self-driving Toyota Prius. Yet, this incredible news should be tempered with caution as it harkens back to a short story written in 1947 by Jack Williamson. Though it is not a one-to-one comparison, it is evidence of human beings' increased reliance on technology which sometimes has good and bad effects. The Internet is a prime example of a tool of unimaginable power to provide information on anything one would ever want to know, but it is also misused by unscrupulous individuals for nefarious intents. Within the context of the story referenced above, Sledge is similar to Google co-founder Sergey Brin who also believes that "self-driving cars can really dramatically improve the quality of life for everyone." When asked during an interview with NPR about the expected mass production of this technology and any partnerships with specific automobile manufacturers, Brin predicted that autonomous vehicles will be commercially available within a decade. The Alliance of Automobile Manufacturers expressed concern that California is moving too quickly to embrace self-driving cars, but this push back is likely based on market share and competition since many automobile manufacturers have also been developing self-driving vehicle technology. But Google is the only company to develop the driverless car technology and move this from concept to implementation. The company's fleet of a dozen computer-controlled vehicles has logged more than 300,000 miles of self-driving without an accident, according to Google. It is an exciting development, but Californians shouldn't throw away their car keys just yet. Next steps in moving this closer to consumer use is for the CA Department of Motor Vehicles to weigh in and draft regulations on how this could be integrated into the current licensing process flow. The DMV has until 1 January 2015 to draft the legislation, but it is a certainty that despite the ability to operate autonomously, a licensed and insured driver will still need to accompany the car in case of malfunction or other emergency which would require human intervention.